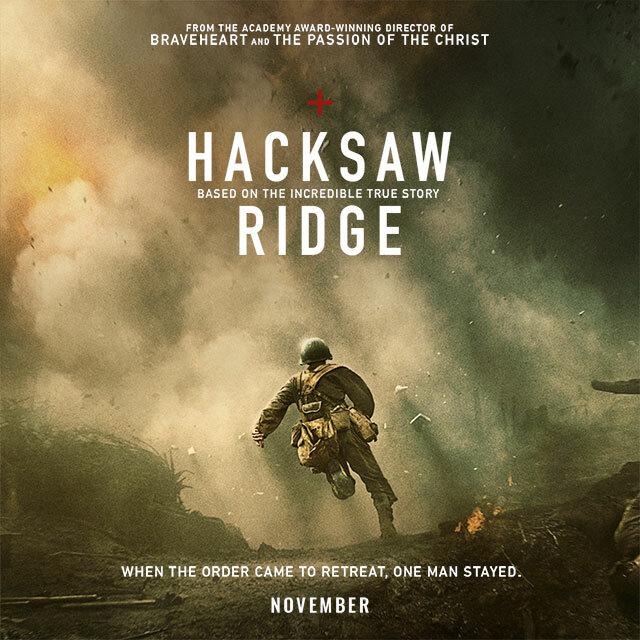 The true story of WWII American Army Medic Desmond T. Doss (Andrew Garfield), who served during the Battle of Okinawa, refused to kill people, and became the first man in American history to receive the Medal of Honor without firing a shot. I was a little worried at first that Garfield was going to come off as a bumbling Forrest Gump with his bashful demeanour and Southern accent BUT he delivered enough charm and charisma to win me over. A strong performance. The first 40-odd minutes was corny but easy going enough as we followed Desmond through his childhood years right up to his enrollment. A good portion of that time was spent on wooing the local nurse Dorothy (Teresa Palmer – Lights Out). It may have been a little schmaltzy BUT the pair had good chemistry and I was happy to watch. The flashbacks flicking back and forth into Desmond’s past broke up the cheesy romance as we discovered the reasons behind his refusal to carry a firearm. It was great to see Hugo Weaving as Doss’ embittered drunken vet father. He played it with aplomb. A tormented man who had already “died” with his men in the Great War. His survival nothing more than a curse. Punishing himself and his family. I was surprised at his reaction when he discovered that his two sons had enlisted. The boot camp training montage was a little predictable. Especially when Doss had to compete with the macho hot head Smitty Ryker (Luke Bracey – Point Break). “No less danger, just . . . while everybody else is taking life, I’m going to be saving it. With the world so set on tearing itself apart, it doesn’t seem like such a bad thing to me to wanna put a little bit of it back together”. I wasn’t sure whether Vince Vaughn would cut it as Sergeant Howell. I was hoping this role would be a change from his usual spiel. BUT his Wedding Crashers style drill call and endless shouting was hit and miss. It was a little too OTT for my liking as he gave the privates nicknames. However, there were a couple of clever one liners. BUT as Doss’ struggle worsened, Howell soon won me over as he realised the stubborn Virginian wasn’t going to back down. Fighting for his beliefs. Sam Worthington (Avatar) was brilliant as the callous Captain Glover. Embarrassed to have a “conscientious objector” in his ranks. Ordering Howell to force the boy’s resignation. Doss’ treatment was shocking. Beaten until he was black and blue by members of his own infantry. Pushed to the very edge. He was even denied a day pass to attend his own wedding. Unbelievable. It went right up to a military tribunal and even during the first attack on Hacksaw, troops were still weary of the medic. The second half of the film was something to behold. A true act of honour and dedication. I had no doubt on ol’ Blue Eyes taking the helm. We had already seen a return to form with his stellar turn in Blood Father and this latest entry from the Braveheart and We Were Soldiers director was a step in the right direction. The violence was ridiculous. Gibson definitely didn’t hold back the punches. It was visceral, gory and bloody as hell. He really showed the true extent of what war can do to a soldier. The only problem with all the CGI (especially with the flamethrower attacks) was that it came off like something out of Starship Troopers! And when Doss kicked that grenade like a football, I couldn’t help but tut. Hollywood had to put their stamp on it somewhere. I was on tenterhooks right up to the emotional and fitting tribute. As every one else had climbed back down off the ridge, Doss stayed to tend to the wounded. Covering up the injured from the lurking Japanese. Evading capture and sniper fire. Discovering their hidden trenches. Tense, gripping. I was completely transfixed as this young man, with no firearm, saved 70 soldiers who were already deemed lost by their superior officers. He even tried to save several Japanese officers who didn’t quite make the journey back to the medical tent. Despite a 139 minute running time, the pace didn’t test. Garfield impressed yet again, giving one of his best performances to date. It was nail biting and enthralling. That final act when Glover apologizes to the crazy Virginian was heartbreaking. The real life interviews and footage in the closing credits really brought it home. A compelling drama as one man defied the odds and fought for what was right. While not the greatest war film, Hacksaw is still worthy of your attention.